Stitches used: ch, sl st, sc, dc, picot. NOTE: Color(s) may be changed for any occasion. RND 1: Using the steel #7 hook and starting at the tip/point of the heart, join yarn with a sl st. Ch 4, sc in same sp. * Ch 4, sk next sp, sc in next sp. Rep from * around entire heart. Join with sl st in 1st sp. RND 2: With hook size "B" sl st in the next ch 4 sp. Ch 3, (dc, picot, 2 dc) in same ch 4 sp. * Sc in next ch 4 sp. (2dc, picot, 2dc) in next ch 4 sp. Rep from * around to the center of the heart. Sk the 2 inner most ch 4 spaces. * Sc in next ch 4 sp. ( 2dc, picot, 2dc) in next ch 4 sp. Rep from * to end. Sc in last ch 4 sp. Sl st in top of beg ch 3. (1) Take a piece of ribbon long enough to go completely around the outside of the heart and still have enough left to tie a bow. Weave this ribbon in and out of the first round being sure both ends come out at the top center of the heart. Tie a bow. 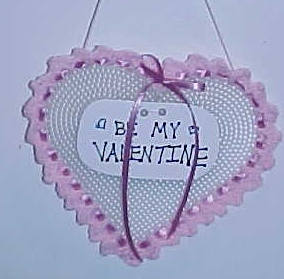 Using a hole punch, make two holes in the top of the sign and attach it to the center of the heart. I tied a knot on the back side so it would stay. (3) Now use a piece of coordinating yarn or another piece of ribbon and attach a hanger to the top of the heart... see photo.